1 My man (1937-Nov-01?) MT B21984-1 Brunswick 8008 3'03"
2 Night and day (1939-Dec-13?) MT W26341-A Vocalion / OKeh 5377 3'00"
3 As time goes by (1944-Apr-01?) MT A4753-1 Commodore 7520 3'14"
5 Let's do it (1941-Mar-21?) MT 29987-1 OKeh 6134 2'57"
6 Georgia on my mind (1941-Mar-21?) 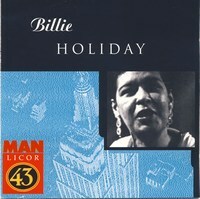 AT 29988-2 Columbia C30784 (album G30782) 3'01"
7 Billie's blues (I love my man) (1951-Nov-01?) BC - Disco S4171 / Monmouth MES 7046 / LDB.08 / JUTB 3039 3'06"
8 Romance in the dark (1941-Mar-21?) MT 29989-1 OKeh 6214 2'17"
9 I'll never fail you 1938-Nov-09 MT B23689-1 Brunswick 8265 3'00"
10 The way you look tonight (1936-Oct-21?) MT B20107-2 Brunswick 7762 3'02"